Kepler Space Telescope sheds light on fast-evolving supernovas. Stellar explosions are a powerful and visually spectacular sight, but there is one type that has confused astronomers for the past decade because of its extremely abrupt duration. Astronomers have continuously tried to understand the true nature of Fast-Evolving Luminous Transients (FELTs), but now, thanks to NASA’s Kepler Space Telescope, it has been revealed that this is a new kind of supernova that gets a brief turbo boost in brightness from its surroundings. Kepler’s main task is to hunt down planets orbiting different stars within our galaxy. For this recent study about FELTs, Kepler used its abilities to precisely examine the sudden changes in starlight from FELTs and come to one accurate conclusion. Astronomers have announced that this unusual light variation was the result of a star collapsing and eventually exploding as a supernova. The major difference between FELTs and other supernovae is that the star is cocooned inside one or more shells of gas and dust. When the initial shockwave from the supernova explosion hits the first surrounding layer of material, most of the kinetic energy will be instantaneously converted into light. This light will only stick around for a few days, which is only one-tenth the duration of a normal supernova explosion. Over the last decade, several FELTs have been discovered over a variety of luminosities and timescales. This variety gives astronomers a very hard task when trying to explain their behaviour, and it is not helped by the fact there is an insufficient amount of observation data regarding FELTs as they’re so brief. Kepler will capture the data from a patch of the sky every 30 minutes, which is rapid when compared to other telescopes that look every few days. This would normally cause FELTs to slip under the radar, making it hard to truly understand the physics of what is occurring. Based on this lack of supporting data, several theories have arisen in the past to explain FELTs, including that they are possibly the afterglow of a gamma ray burst, a supernova boosted by a magnetar (a neutron star with a powerful magnetic field) or a failed Type 1a supernova (a exploding white dwarf after it’s devoured the mass of its companion star). Thankfully Kepler came to the rescue with its precise and frequent observations. “We collected an awesome light curve,” says Armin Rest of the Space Telescope Science Institute in Baltimore, Maryland, United States. “We were able to constrain the mechanism and the properties of the blast. We could exclude alternate theories and arrive at the dense-shell model explanation. 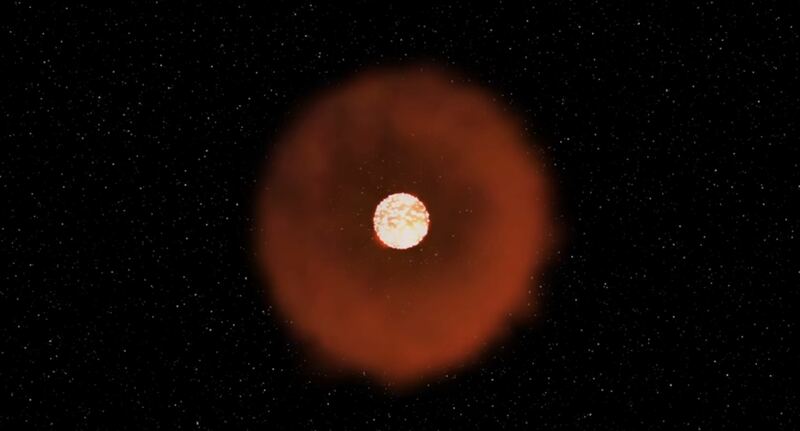 This is a new way for massive stars to die and distribute material back into space. “The fact that Kepler completely captured the rapid evolution really constrains the exotic ways in which stars die. The wealth of data allowed us to disentangle the physical properties of the phantom blast, such as how much material the star expelled at the end of its life and the hypersonic speed of the explosion. This is the first time that we can test FELT models to a high degree of accuracy and really connect theory to observations,” says David Khatami of the University of California, Berkeley and Lawrence Berkeley National Laboratory. This result came as an unexpected, but equally welcome surprise given Kepler’s primary focus is to find exoplanets. Its unique capabilities have proven to be more versatile than first thought, and not just limited to watching a star’s light dip as its exoplanet passes in front of it, blocking out light in the process. In the case of this FELT observation it appears the star ejected a layer of material less then a year before it went supernova. This gives astronomers insight into the closing stages of a star’s life, and apparently FELTs undergo “near-death experiences” just before dying by expelling shells of matter in mini-eruptions before the explosive grand finale.